If you’ve been on MarcJacobs.com recently, you’ve probably taken notice to the newly designed site. Along with the new design is a brand new e-commerce addition to the site. The new site is very playful and unique, it doesn’t have the typical layout of an e-commerce site. The homepage shows an illustration of a store entrance with actual runway video from both of the brand’s collections playing in the windows. There are also pictures of actual sales people wearing Marc Jacobs clothing throughout the site, their outfits and identities change over time. The object was to bring alive the store, said James Gardner, founder and chief executive officer of Createthe Group, the online design firm that has worked with Marc Jacobs since 2004. It’s going back to the roots of the Marc Jacobs brand, which is to be fun, entertaining, engaging and cool. The overall feel of the site is personal and quaint rather than slick and high-tech. 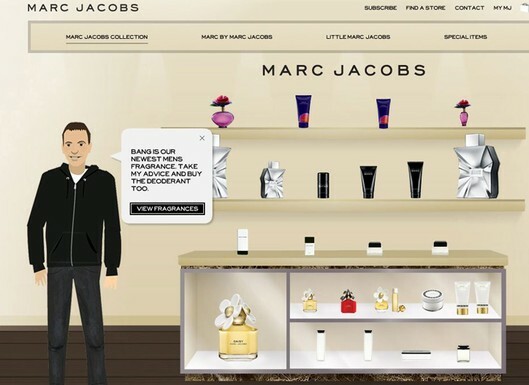 The site will feature all categories online by Marc Jacobs including the Marc by Marc Jacobs line. However, not everything from the collection will be online. For example “special items” from his book store BookMarc will not be available. Prices range from about $30 for perfume to about $8,000 for a fur coat. Since the site does not use Flash, it will work smoothly on mobile phones and the iPad.